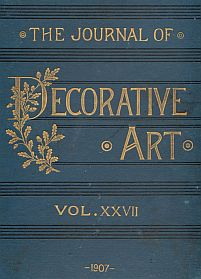 The Journal of Decorative Art was the official organ of the National Association of Master House Painters of England and Wales. It was published monthly and contains detailed national and regional reports on current technical and design trends in the decorative arts, particularly furniture and surface decoration, together with trade news and reports. Possibly because it was a trade journal with a limited circulation, The Journal of Decorative Art is extremely scarce. It is an invaluable source for research on late Victorian and early twentieth century British decorative art from an industry perspective.